Ec Headwear is looking for reps! 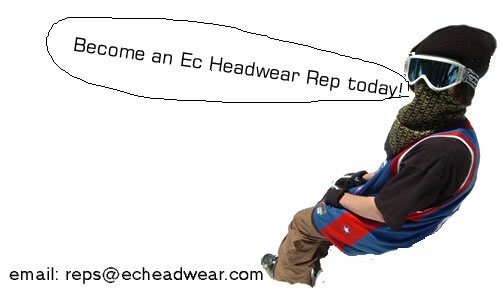 That's right, Ec Headwear is looking for some reps.
Ec headwear is a quickly growing company, and has big plans for the future. To make these plans a reality, it is almost necessary for us to have a successful year this season, and not only sell hats to skiers and snowboarders, but to stores as well. That’s where the reps come into play. If you’re just looking to get lots free stuff and cash, then this job is not for you. I am looking dedicated people who are interested in helping a small up and coming grow into something more. Here’s the run down on how this will work if chosen. If you do not agree or like the terms then you don’t have to apply. - First off since Ec Headwear is still rather small and needs support, if chosen you are asked to purchase ONE or MORE of the new beanies we have to offer. - You will be sent the beanie with stickers to post all over. - Your main job would be this: As I said before I am also looking for shops and stores. Your job would be to present the beanies to the stores around you town, ski mountain, or wherever to persuade them to purchase beanies to sell within their stores. - For every 1-50 beanies the store purchases you will receive $1, for 51-100 hats you get $1.25, and for 100+ you'll recieve $1.50 per hat. It may not seem like a lot, but the more you sell, the more you get. As I noted this opportunity is not a way to get rich quick. - Over time, as you are selling selling beanies, you will receive free ones for yourself. If you think you would be capable of doing this, then you may apply to join the opportunity. Thanks for responding to our call. For those applying you will be emailed if you are chosen, please do not email constantly asking if you were accepted/ Thanks again to everyone’s support.